The trip to Canada during hurricane Irene was a great success. The crew left a good impression on many including this new up and coming mag. SLC magazine in Canada did a feature on the guys that were up there. Letscongratulate Mike, Brett, Yudi, Aidan and J (no longer with us). Seeing your car in print is a great feeling. For those who drove over 8-10 hours to get north of the boarder, this makes the trip even more rewarding. Keep it up. 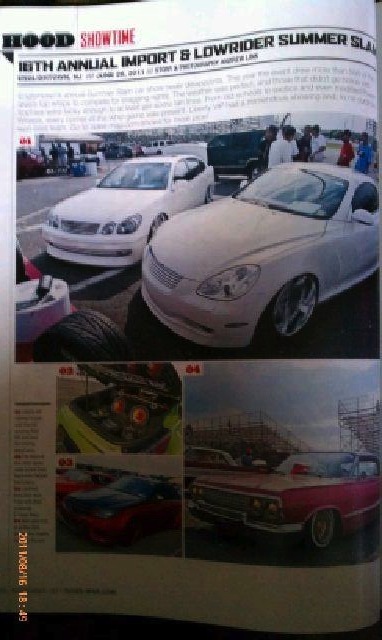 In this months PAS (Performance Audio and Sound), a couple of our members were spotted in the readers rides section. Our boy Nax from St. Lauderdale, FL as well as Aidan from Toronto, Canada. Congrats to the guys getting some much deserved recognition. Something tells me you might see some more Liberty features soon. When you shut down an event of the magnitude of Summer Slam at Englishtown, people take notice. 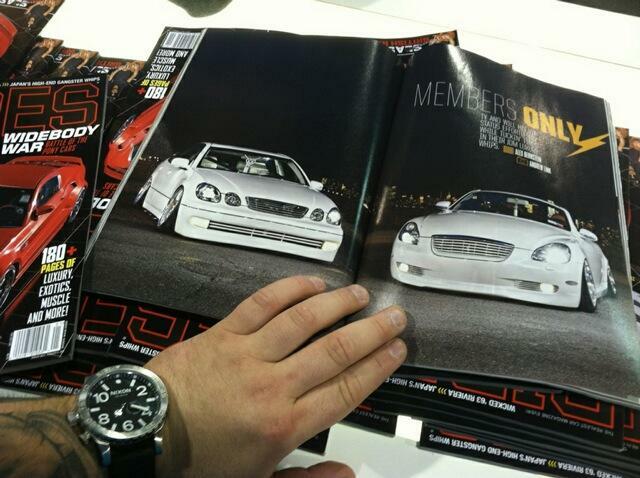 Ty and Will received a pleasant surprise when they seen their cars in the latest edition of RIDES magazine. Congrats guys, hopefully they have some more pages in their future for Liberty members. Chris “20sBurning” from Tennessee, earned his nickname for multiple reasons. The Canibeat “First Class Fitment” car show is still getting tons of coverage all over the place including the United Kingdom. Once again, thanks Canibeat for submitting our pics. We look to have an even better showing at the next one. 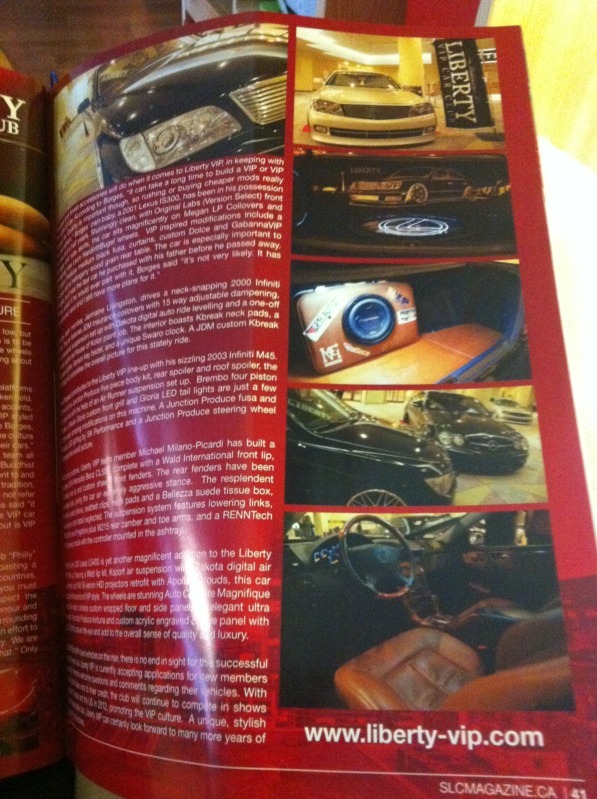 The magazine is called “Fast Car Magazine” available in Europe and certain international book stores. Pictured on the top we have Ty from NY in the white GS, Brendan from MA in the silver F50 Q45, and Chris from NY in the black GS. Liberty VIP got a nice shout out on the top left which was pretty nice. Not pictured is Rodney’s former car (TL) on the other page. We are trying to get a scan of that as we speak. Congrats everyone. Mark once again gets some love from the magazines. This time around it’s of his 3rd gen GS and not his M45. The feature is in the next up coming PAS magazine (Performance Audio & Sound) available sometime in March. You can’t deny the Liberty plate on the dash gives this ride added swag. It’s a coincidence that it matches the black polish Trafficstar STR’s perfectly. As far as the car goes, it is a fully done up from audio to brakes and everything in between. The feature is well deserved from a seasoned veteran in the scene so go pick up the magazine at a newsstand near you.